During a recent conversation with Rob G0WSC, he told me he was installing a new Yaesu G1000 DXC rotator, and he was looking forward to having computer control. I was immediately interested, because if computer controlled, the rotator would be accessible for a blind user. Rob then mentioned he could adjust the bearing by turning a knob and pressing a button. This all seemed very promising, so Rob brought his rotator control box over to my QTH for me to have a look at. The Yaesu G1000 DXC is classed as a heavy duty rotator, capable of turning a full size 3 element HF beam. The rotation torque inch / lbs is 950, and the braking torque inch / lbs is 5200 (figures taken from the Vine Communication rotator comparison table). Looking at the other Yaesu rotors, I would say it is in about the middle of the range. The control box was marked T1AL, and was 200 x 130 x 193mm, and weighs 2.8kg. It turns out Rob is not actually going to control the rotator from the PC, but from his Yaesu DMU. But, looking at the control box, the rotator appears to be completely accessible as a standalone unit. My very first rotator was a Kenpro KR600. This rotator had Clockwise and Anticlockwise levers, but the needle was hidden under the glass facia. Fortunately, the axle for the needle protruded through the glass, and we were able to fix a tactile pointer to this central boss, on the outside of the glass. This meant I could hold down either lever and feel the direction of the antenna as the pointer moved. The G1000 DXC control box is several times better than this. Firstly, it has a tactile knob allowing you to select the bearing. I guess the knob is about an inch in diameter, and has a small bump on the front face. Just turn the bump to the 9 o’clock position, and this will equate to a bearing of 270 degrees, or West. Then, just press the Start button, and the rotator will turn. There is no need to keep your fingers held on either the Clockwise or Anticlockwise buttons! We then had a look at the glass plate covering the analogue direction pointer. Much to my surprise, the glass plate is designed to be removed, so a more detailed clock face can be fitted! Within seconds, the glass cover was off, and I found the direction pointer to be very tactile. I do not know how robust the needle would be, if the glass cover was permanently removed, and the pointer continually checked. It is possible to connect the G1000 DXC to a PC for computer control. This requires an additional Yaesu interface box with appropriate cables, but the unit appears to be very expensive. In fact, I found the price to be very slightly more than the rotator itself! The interface model is GS232A and measures 110 x 21 x 138mm, weighing 380gms. There is also a small knob on the control box to adjust the speed of the rotator. As there is no automatic slow start and slow stop on this rotator, I assume it would be easy to increase the speed manually if you are moving the rotator over a large distance, but decrease the speed again for the stop. In summary, the Yaesu G1000 DXC seems to be perfectly accessible as a standalone rotator control box. You can either select the heading using the tactile knob and then press the start button, or you can hold either the Clockwise or Anticlockwise buttons and monitor the pointer with your fingers. Connecting the rotator to a computer is possible, but unless I am mistaken, appears to be very expensive. Finally, if you are looking at the G1000DXC based on this evaluation, please make sure the control box is the same. I can well imagine the rotator could be supplied with another controller. Likewise, other Yaesu rotators in the range. Very interesting. 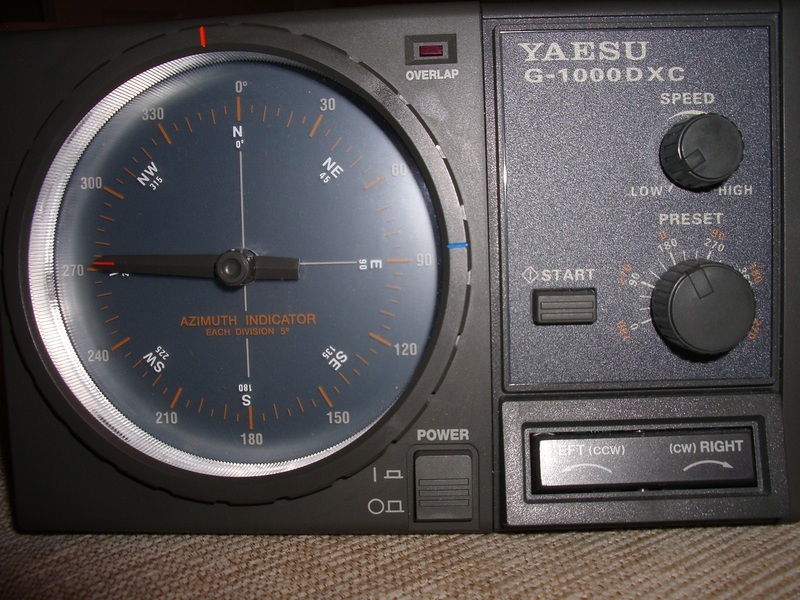 Prior to owning the PST rotor, I used a Yaesu g1000sdx for around 8 years. The controller appears to have been re-designed, as there was no pre-set control on the original unit I had here. I employed the method of removing the glass facia plate to great effect. The direction pointer was reasonably robust, and providing one wasn’t too heavy handed, it remained in place. It certainly made for a very accessible method of rotator control, which has been made even better with the addition of the pre-set facility. can be pressed to turn the rotor from where ever it is to a preset direction. the rotor will automatically go to where you had set it up to go. There is a knob that you can adjust the stop point to, so when the button is pressed, the rotor goes to that set point. I set mine to stop at due North. So, no matter where I am pointing, the rotor always returns to North. I don’t know if the G800 has this feature or not, but just call HRO, and they could tell you. If you intend to only put up a small yagi, the G800 may well be adequate, but if you are putting up a large yagi with many square feet of wind load, then opt for the G1000, or if the yagi will be huge, better go for the G2800. Yaesu rotors are not cheap. I don’t remember what the G800 costs, but I think I paid about $800 for the G1000, and over $1500 for the G2800. This entry was posted in Accessory Evaluations, All Evaluations and tagged Yaesu by The Active Elements Team. Bookmark the permalink. Not many use Yaesu’s own (expensive and antiquated) rotator to pc box .. most use idiom press’s card (now with usb), which is about $150.